13w47a is the first snapshot released for Java Edition 1.7.4. Microphone can be recorded too. Chat integration in the game. 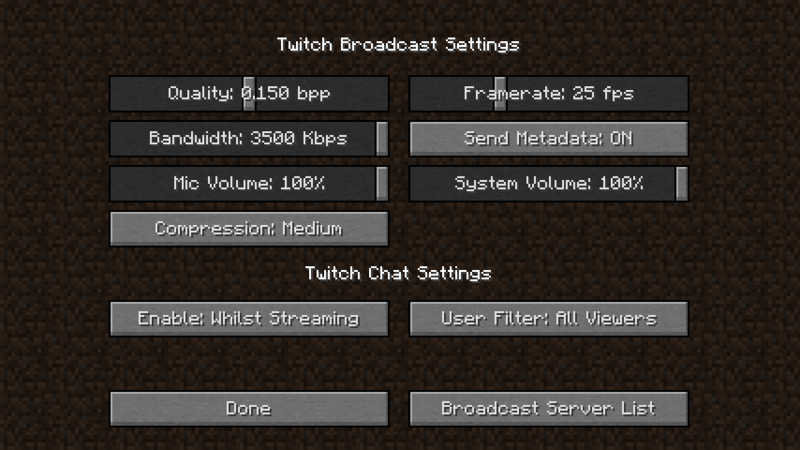 Quality, Framerate, Bandwidth, Send Metadata, Mic Volume, System Volume, Compression, Enable Chat and User Filter (for the Twitch chat). New Mojang Logo shows on game startup. Better full screen for macOS. MC-12413 – Furnace GUI - "full" arrow texture always drawn on leftmost column. MC-14323 – Minimising other windows open, resizes Minecraft window. MC-23132 – Click or right-click stuck on OS X.
MC-26102 – OS X Fullscreen is not supported. MC-30537 – Flower duplication glitch. MC-31388 – Right clicking a flower pot that has certain plants in it while holding another plant replaces the one in the flower pot with the one the player is holding. MC-35643 – Items with enchantment effect cause blocks and potion effects indicator to not render. MC-35658 – Water is too transparent. MC-35797 – Background rendering issues when picking up enchanted items/caption of containers white. MC-36383 – Translucent parts of stained glass not visible in 3rd person mode. MC-36395 – Weird rendering of transparent blocks on the 0-axis. MC-36705 – Block held in 3rd person rendered incorrectly. MC-37106 – All the textures are flipped/mirrored on north/east sides of blocks. 13w47a was previously removed from the launcher for some time, but was added back in September 2018. This page was last edited on 22 April 2019, at 04:58.